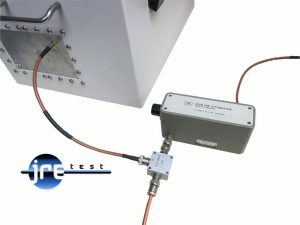 Many times a shielded test enclosure is called upon when actual radiated RF signals must be used rather than connection through coaxial cables and connectors. 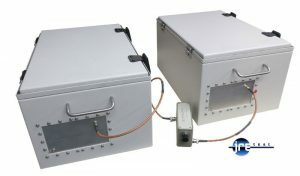 In these cases, the device under test operates within the small confines of the RF shielded test enclosure and antennas are placed inside the enclosure to radiate or receive the RF test signal. So, just what sort of signal loss can we expect in this configuration? We’ll take a look at a few different scenarios at various frequencies and with different antennas. Two JRE 1812 test enclosures interconnected with antennas and step attenuator. Boxes are closed so all signals between the enclosures have to pass through the step attenuator. First, we need to understand the process of an antenna radiating or transmitting an RF signal – and by reciprocity, an antenna functions the same electrically when receiving. So, while we will be discussing the radiation from an antenna, understand that the same thing happens in reverse when an antenna is receiving. One can delve deeply into the physics of antennas, but in our case we wish to simply understand how signals are radiated inside an RF shielded test enclosure. We’ll call the device that creates the RF signal a ‘transmitter’ and the device that captures and utilizes the RF signal a ‘receiver’. To make things simpler to describe, we’ll generally describe the transmitter side of things, remember that the same effect takes place when receiving. 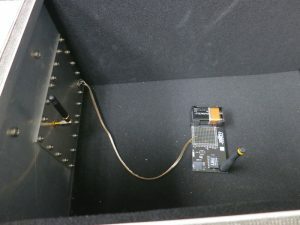 We will also stay at a basic level in describing some principles and take some liberties in the way we define and explain things – again, this paper is to help shed some light into the effects and expectations when using small antennas within a shielded test enclosure environment. The antenna is the device that takes the RF signal from the transmitter and ‘launches’ this signal out and into the air. A coaxial cable is used to connect the transmitter to the antenna and forms an important part of the transmission system. I’m sure you have heard of coaxial cable impedance, SWR, reflected power, forward power, match and other such terms. These terms are used to indicate and describe the efficiency, operation and general characteristics of the antenna and transmitter overall. Basically one wants to maximize the power from the transmitter and to make sure all of it radiates from the antenna, with all power being sent off into the air. Transmitters perform best with properly matched impedances and components, ensuring all power gets coupled to the coaxial cable, and then to the antenna, with all power being fully radiated from it, with nothing getting reflected or ‘bounced’ back to the transmitter. This is why you will see (commonly) 50 ohm cables, 50 ohm antennas and 50 ohm transmitters. The antenna has a tough job matching the free space of the air to the transmitter’s coaxial cable. The antenna needs to have the same impedance as the cable and this means the antenna must have an impedance close to 50 ohms. Since the antenna is coupling the RF energy into the higher impedance of free space, there are a variety of methods used to create this 50 ohms at the antenna feed point. One of the most common antennas is the ‘Quarter-wave’, its advantage is that it’s feed point impedance is very close to 50 ohms. In its basic form it is simply a piece of wire that is one-quarter wavelength long at operating frequency. 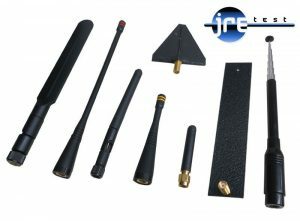 There are many variations of this simple antenna, but in many cases it will be the most common antenna used, and thus one of the best antennas to use in comparing against others. If an antenna is tasked with operating over a wide range of frequencies, obviously the wavelengths involved will be different and this will present a problem in that the antenna cannot be a quarter wavelength long at all frequencies. There are many techniques used to allow an antenna to be properly matched across a variety of frequencies, generally extra matching components are used or a series of antenna elements of differing dimensions are used. If your testing involves widely spaced frequencies, the antenna selection will be more complicated. Variety of test antennas used with RF shielded test enclosures, most are quarter-wave type. All available from JRE Test. So far, we have become a bit familiar with antennas and their connection to transmitters, but what can we expect for signal levels and such? We made some measurements at popular wireless frequencies using common quarter-wave antennas as well as the JRE Test BBA broadband antenna. Signals were applied to a transmitting antenna and a nearby receiving antenna was used to measure the received signal strength. Knowing the applied transmitter power and then the measured received signal power, we can easily calculate the ‘path loss’ between the transmit and receive antenna combination. In the cases outlined below, we have used antennas placed approximately 10 inches (25 cm) apart and polarized in the same orientation. Polarization is a term used to describe the geometry of the emitted wave from an antenna. An antenna that is vertically polarized will have its radiation wave in a vertical plane, while a horizontally polarized antenna will have its wave in a horizontal plane. There are other polarizations that are circular, but that is not important for us in this discussion. It is important to note that cross polarization of the transmit to receive antenna can result in severe signal degradation, but in the confines of a small test enclosure this effect is minimized. Bear in mind that there will be variations in signal levels depending upon antenna placement, polarization and distance between, but these measurements are accurate enough to get a general handle on what can be expected. For repeatable measurements, one can use a firmly fixed test fixture to ensure the test device is always placed in the exact position each time within the test enclosure. Here is a diagram of the set-up to measure the ‘Path Loss’ between two antennas. The transmitter signal source was set at 0 dbm and a spectrum analyzer was used to measure the received signal. The indicated signal was then read in dbm from the spectrum analyzer screen. Using the BBA-1 Broadband antenna, signal levels were 25 dB lower than the quarter-wave antenna, this is the price we pay for having an extremely broadband antenna - more loss but the ability to operate across almost 10 octaves of frequency range. Knowing the path loss allows us to estimate the power needed in order to radiate a sufficiently strong signal to a device inside the test enclosure. Knowing the required signal level for proper operation of a receiving device, along with the path loss, we can then set our signal source to the correct level to radiate this amount of signal within the test enclosure. For example: We have a wireless doorbell receiver that operates at 433 MHz and engineering has designed this receiver to have a receive sensitivity of -100 dbm. This is the minimum power required for the receiver to operate correctly. Knowing that the path loss using quarter wave antennas is 30 db, we can then calculate that the external signal source must put out -70 dbm into the transmit antenna inside the test enclosure for the receiver to ‘hear’ it. Knowing the path loss allows us to quickly estimate the required signal levels needed to do our tests. If we wish to do a sensitivity check on a series of these devices, as you might find in production final test situation, we can select a suitable “gold standard” device (one that is properly operating to spec), affix it to a immovable and secured test fixture inside the test enclosure, adjust our external signal source to the correct level to radiate the proper signal and test our devices. The immovable test fixture keeps everything in the same position and makes the test repeatable. We use a “gold standard” device to calibrate the system since the path loss figures above are typical figures and not exact for each and every device and test set-up, the figures allow us to quickly get in the “ball-park” for what we can expect. Another example: We have a wireless doorbell button transmitter that operates at 433 MHz at an output power of 0 dbm. Using a spectrum analyzer or calibrated receiver, we can easily check RF power output that is radiated from the doorbell transmitter. Using a quarter wave antenna inside the test enclosure, we know that the path loss is 30 db, so if we measure -30 dbm from this antenna, we know that the transmitter inside is radiating the correct 0 dbm signal. Once again, we can calibrate this test by using a “gold standard” device to measure the exact signal strength received when mounted in an immovable fixture, and then the production line units can be repeatedly tested thereafter. The path loss figure gives us a good starting point as to what to expect in signal levels when starting. Let’s say you are doing tests on units that operate over a wide frequency range. In this case the BBA antenna offers wide frequency response, however at a greater path loss. In this case one should figure in another 25 db of loss to figures above. For example, in the 433 MHz doorbell scenario, the path loss would be the quarter wave figure plus the 25 db extra from the loss in the BBA broadband antenna – path loss would be 55 db. In some instances, you would like to have one wireless device ‘talk’ to another as you would find in an actual wireless environment. You would have one device inside one test enclosure and the other device inside another test enclosure, with a coaxial cable linking the antennas inside each test enclosure. Connection of two test enclosures with coaxial cable. In this diagram, we have Device 1 radiating to an antenna inside Enclosure 1, with a coaxial cable connecting to an antenna inside Enclosure 2, which radiates to Device 2. To use our wireless doorbell example, there would be 30 db path loss from Device 1 to the antenna in Enclosure 1, and again 30 db path loss from the antenna to Device 2 inside Enclosure 2 – for a total of 60 db path loss total (ignoring the small loss in the coaxial cable connecting the two enclosures). If Device 1 puts out 0 dbm, this means that there will be -60 dbm of signal received on Device 2. Let’s say we wish to simulate more distance between the two devices. We can do this by adding an attenuator in line between the antennas on the two test enclosures. By varying the attenuation, we can make the signal weaker between the two devices. Two JRE 1812 test enclosures interconnected with antennas and step attenuator. We can make this test even more real-world by adding in interfering signals such as noise, other RF signals or anything else you can dream up. To do this we add a simple power combiner and introduce the interfering signal through one of the ports on the power combiner. The antenna will now radiate not only the desired signal but also the interfering signal you introduced with the power combiner. If you are introducing an interfering signal at a far different frequency, the broadband BBA antenna is useful because of its wide bandwidth. Power combiner in circuit to add in additional signal(s) such as interference. Mini Circuits makes a broad line of low cost power combiners, just select a suitable device based upon frequency of interest as well the number of ports needed to introduce the number of interfering signals you wish to add in. In the picture below, you can see a Mini Circuits ZFSC-2-5 which is a two way (combines two signals) zero degree (combines the signals in-phase) device that is good from 10 to 1500 MHz (ideal to use in our wireless doorbell example). There is also a step attenuator in the picture, to show the connection one could use to vary the coupling between the two test enclosures as well as adding in an interfering signal. The sum junction of the power combiner is driving the test enclosure to the Left, interfering signal is applied to the coax at the bottom and desired signal is coming in from the Right cable after going through the step attenuator. Using a power combiner to add in an extra interfering signal and a step attenuator to adjust desired signal. Combined signals are then fed into the shielded test enclosure. 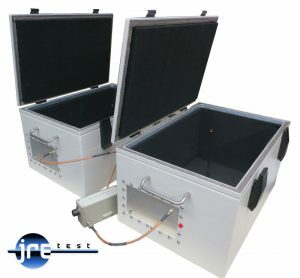 The above tests were performed using JRE Test JRE-1812 test enclosures with a simple I/O plate and bulkhead SMA connectors and a single feed through capacitor that was used in some tests to measure signal strength (RSSI) from the various receivers. A variety of different antennas and devices were used in measuring the path loss figures. This paper should help you to understand the techniques used to radiate signals into and out of an RF shielded test enclosure, and some general values for expected path loss of various antennas at different frequencies. You can see there is nothing complex to setting up such tests and even how to simulate real world operation with interfering signals and greater distance between devices by using an attenuator.